The Percepto solution was designed to enhance your business every step of the way. That is why our multi-mission drone was created with the power to act and react based on your unique operational needs. Designed with industrial and enterprise needs in mind, our advanced drone has the capabilities to operate autonomously based on scheduled missions as well as on-demand triggers. With Percepto system on-site you gain constant visual insights and notifications on security, safety and inspection missions with no human intervention. Beyond offering autonomous operations and 24/7 availability, the Percepto solution allows you to manage multiple sites and fleet of drones remotely and simultaneously without additional burden on your security and operations teams. Percepto was founded in 2013 with the goal to provide an intelligent multi-mission drone capable of conducting missions based on a computer vision applications. Percepto now offers advanced functionalities to large scale enterprises looking to improve security, reduce safety risks and operational costs and optimise maintenance cycles. 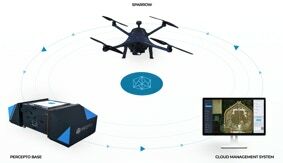 The Percepto Solution is comprised of the Sparrow drone, powered by our proprietary PerceptoCore ™ technology, alongside the Percepto Base and the Percepto Cloud Management System. When installed at your location of choice, the Percepto Solution has the power to operate autonomously without human involvement. If desired, operators can interject live-missions and get immediate insight into what&apos;s going on at your site. Integrating a Percepto Solution into your existing security scheme would result in faster response to any sensor triggered and better management of any security or safety event. The ability to withstand extreme weather conditions, operate without human involvement day or night,and react to integrated smart devices makes the Percepto Solution ideal for maintaining and improving ongoing operations and activities. WEATHERPROOF - The Sparrow is an industrial-grade, weather-proof drone capable of operating in heavy rain, snow and dust conditions. FAST CHARGING - When docked at base, the Sparrow undergoes fast charging and performs automatic self pre- and post-flight checks. DAY & NIGHT (THERMAL) VISION - Sparrow is equipped with a dual camera set that enables day and night (thermal) high resolution recording capabilities. Combined, these capabilities ensure the Sparrow can 24/7 operations without payload switching. PERCEPTOCORE™ - is the heart of the autonomous operations and what enables its unique set of capabilities. The PerceptoCore™ is what makes Sparrow like no other allowing real-time analytics and fully autonomous cycles including conducting takeoff, navigation and landing. The Percepto Base is what enables the Sparrow to function entirely autonomously and without needing human involvement or intervention, making it ideal for continuous operation in remote and dangerous locations. When not in flight, the Percepto Base serves as a shelter and charging station for the Sparrow. As soon as the Sparrow is required for another mission, it communicates independently with the base and takes-off for its next mission. The Percepto CMS is the point of contact for Percepto Operators to define mission details and schedule, review mission data and communicate in real time with the operator in cases where intervention may be required. FLEET MANAGEMENT – Manage a single Sparrow or a fleet of smart drones from the advanced Percepto CMS. Simultaneous and individual drone deployment and mission management is simple through the CMS. DATA MANAGEMENT – The Percepto CMS automatically archives mission data as the Sparrow docks in the Percepto Base. Through the CMS, mission data can be easily retrieved and analysed by operators. SITE SETUP AND MISSION PLANNING – The CMS defines the operational landscape and flight limitations and restrictions based on local regulations and company needs, including mapping out free flight zones, no flight zones and points of interest (POI) for the Sparrow. Pre-scheduled missions and reactive triggers are set within the CMS. REAL-TIME ALERTS – The CMS enables operators to deploy the Sparrow to on demand missions or gain control during a mission. The CMS also sends real-time notifications to relevant personnel based on pre-set trigger events.